1 Adsense Account for Many Blogs, Banned or Legal ? Home Blog 1 Adsense Account for Many Blogs, Banned or Legal ? Work and beeing a writer on your site or having blogs is a fun job. Especially if you do it by wholeheartedly. Write a content because your passion and is not because for pursuing revenue. But there is one problem that becomes pro and contra for blog owners who have many adsense accounts. 1 Adsense Account for Many Blogs, Banned or Legal ? Today, iweblogsite will discuss about this problems. It's a common thing if your Adsense account hit Banned by Google due to cheating other people. If we only use one account for one blog, then every day we can monitor through our smartphone. Just imagine if you have a lot of Adsense account and have to Login repeatedly on the same Device. Dizziness, Stress and finally you will be lazy to check your Account, right? If 1 blog and the traffic is and not enough then Adsense earnings can not reach $ 100 per month. If you use 3 blog then I am sure you can payout Every Month. I Suggest 1 Adsense Account is better used for Maximum 3 to 15 Blogs or Websites, Why ? Using 1 Adsense account, you can monitor which blog or website do the violation and quickly you can take action. One quick action that can be done is to remove Adsense Ads temporarily until conditions improve on the blog. It is a simple tips to use 1 Adsense account for 1 site. 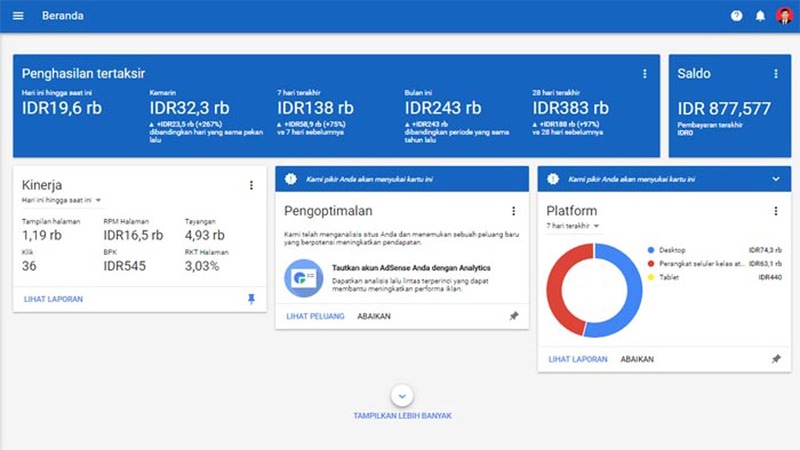 But if you still want to use adsense account for many websites, is it safe? It is safe, if you can handle your blogs or sites periodically, keep update the content and do not violate the Adsense's TOS. You can integrate 1 adsense account for 3 to 15 blogs or website as long as you can handle them. Do not be greedy because God will give the best for you. Manage at least 5 Blogs only and updates in periodically. See the results and then you will payout every month. How? I think you've learned how to prevent your adsense account from permanent banned. Use one Adsense Account and be well cared for so you can earn a monthly income from Adsense. Please share this article if you think usefull for others. Also leave your comment here, below. Thanks for visit iweblogsite.